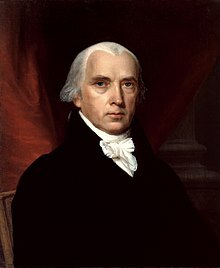 James Madison (March 16, 1751 – June 28, 1836) je oloselu ara Amerika ati Aare ibe tele. ↑ James Hutson (May 31, 2001). "James Madison and the Social Utility of Religion: Risks vs. Rewards". The Library of Congress. Retrieved November 18, 2009. ↑ See "MADISON, James, Jr., (1751 - 1836)". Biographical Directory of the United States Congress. US Congress. Retrieved 2009-08-24. , "James Madison Jr.". teachingamericanhistory.org. Retrieved 2009-08-24. and "Madison, James, Jr.,". Princeton University. Retrieved 2009-08-24. Àtunṣe ojúewé yi gbẹ̀yìn wáyé ni ọjọ́ 8 Oṣù Kẹta 2013, ni ago 23:28.